Bizarro Ted from How I Met Your Mother. Or maybe Bizarro Grimm? So after discussing the SLoSH Top 10, I mentioned that Slosh039 Bizarro really needed a column all his own, and thus I wasn’t going to include him in the set review itself. Well, his day has come! Did you take all that in? 25 Points for a Orrazib token–you can pay as little as 25 Points for 1 token or 300 Points for 12. So far so good. Interesting mechanic, and the fact that you roll through his 12 clicks is both good and bad (or great if you continually land on Click #7). Looking at Bizarro’s dial, he has great defensive powers (if not a great defensive value) throughout his whole dial (8 Clicks of Super Senses, 4 Clicks of Impervious). He’s always gonna have at least 3 damage showing, and he can frequently augment that with Super Strength or RCE (or sometimes both). The point of all this is to say that yes, pretty much every one of these clicks is worth 25 Points. But his stats and standard powers aren’t what make Bizarro so unstoppable. Look at the Trait again. “When Bizarro takes damage, remove one Orrazib token from his card.” This power is what makes Bizarro so damn near to broken. Every packet of 25 Points you spend (beyond the first) on Bizarro nets you all of his stats and standard powers… AND A STOP CLICK! That’s right, one of the best–if not THE best–defensive mechanics in the game is thrown in on every click beyond the first… FOR FREE! What?! Outwit all of his defensive powers if you want, but each attack you aim at Bizarro will–at most–do one damage. There’s not another figure in the game with access to 11 Stop Clicks. As far as I know, in Modern, there’s a couple figures–MAYBE–with access to two Stop Clicks: TAB APP Wolverine and Chase Guardian from SL0SH (yes, there may be a couple more that are escaping my brain at the moment–but you get the point). Chase Guardian is more than 200 Points. A 200 Point Bizarro would have SEVEN Stop Clicks! That is unreal! I don’t know how WizKids values Stop Clicks in terms of Point Cost, but I can argue that a Stop Click should cost at least 10 Points all by itself (it’s forcing your opponent to invest at least one more action–and possibly more–to KO a figure that would have otherwise already been KO’d. It’s like a football game going to overtime; anything can happen, which is good for you, but terrible for your opponent). Well, we just looked at Bizarro’s dial–each of those clicks seems to be worth 25 Points as they sit. When you add in the Stop Clicks, you are exceeding 25 Points worth of value ON EACH CLICK YOU PAY FOR AFTER THE FIRST. And what am I always telling people? Don’t pay retail point costs when you can get better value if you just shop around (ie, do your research). Well, Bizarro is like the Costco of Heroclix figures–the more you spend, the more you save. In building your army, it is always to your advantage when you field a team that’s within the build rules of the game you’re playing yet contains more points than the game’s build allows. Well, Bizarro is one way to do that (Primes are another way). Me am no have down to eleven start clicks? Me am think that not ridiculous! And it’s also the reason Bizarro has been showing up so much in the Meta! The sweet spot in terms of his casting cost seems to be somewhere between 3 and 7 Orrazib tokens. In that range, he becomes SO damn hard to kill unless his opponent is playing some sort of swarm team. His only drawback is the possibility you’ll land on one of his four clicks of Sidestep (instead of the 8 clicks of Charge and Hypersonic Speed he has). 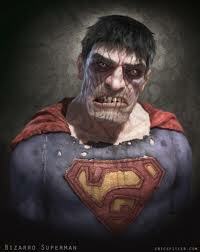 But even that’s not too bad, especially when Bizarro has a Range of 6. To make matters more broken, Bizarro has the Superman Enemy TA, which means that if you partner him with someone else who has that TA (cough-Luthor) or a Wildcard TA (Like the entire freaking SLoSH set), you can start all sorts of Outwit shenanigans. His adaptable cost also make him really popular as a “filler” piece in a lot of armies that come up slightly short in points. I’ve played against Bizarro a couple times now, and I didn’t enjoy either game much because Bizarro was nigh impossible for my guys to take down. For all the fuss everyone has made about Slosh026 Mr. Miracle being hard to take down, Bizarro is almost as difficult to hurt in any substantial way. So, in conclusion, he is definitely worth seeking out if you want to field a really good Legion of Doom team. Or if you just like 5 star figures. Will he end up on Watchist 2? Possibly. But for now, you can use him to your heart’s content!! Well, that’s all for today–see you this weekend for the Weekly Roundup!! I never thought of Bizarro as having stop clicks but you’re totally right. Good call! I loves me some stop clicks.